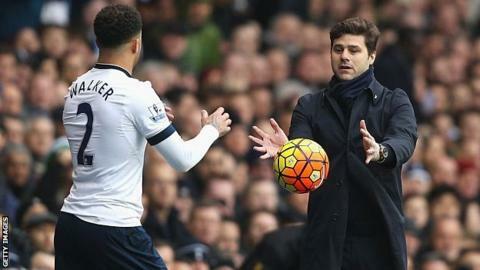 Mauricio Pochettino says more top players may want to leave Tottenham to win trophies, but he is not worried about the club's long-term plan. On Saturday Spurs visit Premier League leaders Manchester City, who signed defender Kyle Walker from them last summer for an initial £45m. But Walker is the only big name to leave Spurs in Pochettino's reign. "It's human nature the players always want to improve and have different challenges and ideas," said Pochettino. "Maybe some players are not agreed in this plan and this strategy and of course they are right to complain, to talk and in the end to want to move or have another challenge for different reasons. "The most important thing is to talk, to design the plan for everyone and then be happy everyone because life is about enjoying and being happy." Chairman Daniel Levy has committed most of Spurs' top players to new deals, despite the club's last trophy being the League Cup in 2007-08. Tottenham sit fourth in the table heading into Saturday's game, but finished second last season and Pochettino says he is "thinking long-term". "We're not worried," said the Argentine. "We know how our project is and who we are, and in the end we try to develop our project not only thinking about today and tomorrow, but thinking long-term. "That is so important, because it's not only that we need to win today, tomorrow, after tomorrow. "We need to win today, tomorrow and in one year and two, three, four years. That is the plan for Tottenham." Tottenham had a really solid 11 last year, one that people were saying was the best in the Premier League, and they are nowhere near that now. That's based on selling one of the best right backs in the country rather than keeping him happy and keeping him at the club - I know he would have stayed. I think there was a massive breakdown in getting one of the best right-backs in Europe to stay at the club. I'm pretty confident Kyle Walker wanted to stay. It wasn't really about money. It was a respect element. He probably thought 'listen, can I be involved in certain conversations about what we'll be doing? I look at myself like a captain of the club, I've been here so long'. The wage structure is always going to be Tottenham's downfall. I spoke to a Tottenham player towards the end of last season - a full intentional, regular for his country, regular for his team - he told me what he was on wages wise and I was on more money at Newcastle in 2002. This is a player now at Tottenham, who finished second in the league, a full international in 2017, and he wasn't on what I was on at Newcastle. What Tottenham have been blessed with is their recruitment has been fantastic where they get all these players who have the potential to become the next Dele Alli or Kyle Walker and then they don't have to worry about the wages, but for Tottenham to go to the next stage they need to sign world class, established players.